KNOXVILLE - Two Tennessee high school students have now done what many scientists strive for: publishing their research in a top science journal. 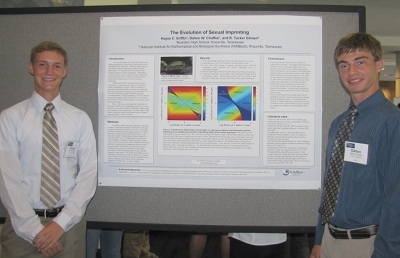 Dalton Chaffee and Hayes Griffin worked with mentor R. Tucker Gilman, a former postdoctoral research fellow at the National Institute for Mathematical and Biological Synthesis (NIMBioS) at the University of Tennessee, Knoxville, to study mate choice. Their work was published this week in the journal Evolution. The students began their research between their junior and senior years at Bearden High School in Knoxville. They wanted to know why individuals choose the mates they choose. Using a combination of analytical models and individual-based mathematical simulations, Chaffee and Griffin made several important discoveries that shed new light on how mate choice is influenced by "sexual imprinting," a process whereby individuals express preference for mates with traits similar to their mothers, to their fathers, or to other adult members in their population. It is known from field studies that females of many species are choosier about mating partners than males are. "Sexual imprinting is common in nature, but different species do it different ways, and how it evolves is poorly understood," said Gilman. "Dalton and Hayes wanted to know why different species should evolve to imprint on different individuals." The research showed that if the apparatus females use to identify and select their preferred mates requires a lot of effort to maintain-for example, if they must have special cells in their eyes to see male colors-then sexual imprinting will not evolve. This suggests that a complex apparatus used for sexual imprinting must evolve initially for some other reason, such as to avoid predators. When imprinting does evolve, females will choose mates like their fathers - which increases the likelihood of viable offspring and sons that are sexually attractive to females - like the fathers were to the mothers. In situations where the father is absent, females can evolve to imprint on their mothers or on randomly selected adult males. This kind of imprinting allows females to select mates that will give them viable offspring, but it doesn't guarantee that these offspring, particularly sons, will be sexually attractive like the females' fathers were to the mothers. "The paper gives researchers and empirical scientists alike a better idea of the circumstances under which different types of sexual imprinting develop," Chaffee said. "Hopefully, this will in turn allow them to better understand sexual selection, both for individual species and on a large scale." Chaffee said that he and Griffin spent about 20 hours each week on the project, including reading reams of biological studies about sexual imprinting and learning how to use sophisticated computer programming software to run their simulations. "Just reading was extremely difficult, as much of the jargon and format was completely unfamiliar and very complex," he said. Gilman said he was impressed with the students' drive and initiative. "Dalton and Hayes needed very little guidance and demonstrated a great deal of commitment to the project," said Gilman, now a faculty member at the University of Manchester, UK. "Their results explain something completely new about the way mate choice and sexual selection work, and will motivate future work in these fields. That is quite an achievement for scientists at any level." The research won a regional finalist award last year in the nationwide Siemens Competition in Math, Science & Technology and was also presented at the international meeting of the Society for Mathematical Biology in 2012. "The entire experience was by far the most strenuous academic task I have undertaken, but it was also the most rewarding," said Chaffee. This fall, Chaffee will be a freshman at Purdue University and Griffin will be a freshman at Duke University.